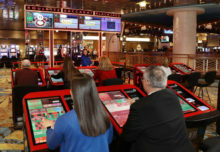 The land-based casino industry in Europe is gearing up for the annual European Dealer Championship (EDC), which will be held at Olympic Casino group’s flagship operation, the Olympic Park Casino Tallinn from 29 April until 1 May. Going from strength to strength, the competition will attract Europe’s 37 best dealers. The high-calibre line-up from 20 countries includes previous winners, runner-ups and talented newcomers eager to show their skills. Dealers are ranked on technical skills, game control and hospitality in the group stages and final rounds. A number of side events will also take place at the EDC. The ECA is grateful for the sponsors of the EDC: Scientific Games, Clarion Gaming, Dallmeier, Genesis Gaming, TCS, Matsui, Association of Gaming Equipment Manufacturers (AGEM), GPI Gaming, Abbiati, ICS Europe, CLS and CTC.